Congratulations to the Miami Heat on Winning the NBA Championship!! The Miami Herald would like to congratulate the Miami Heat for winning the NBA Championship and they would like you to know you can buy their adidas championship gear at Macy’s. It’s a shame they actually lost the series 4-2 to the Dallas Mavericks. 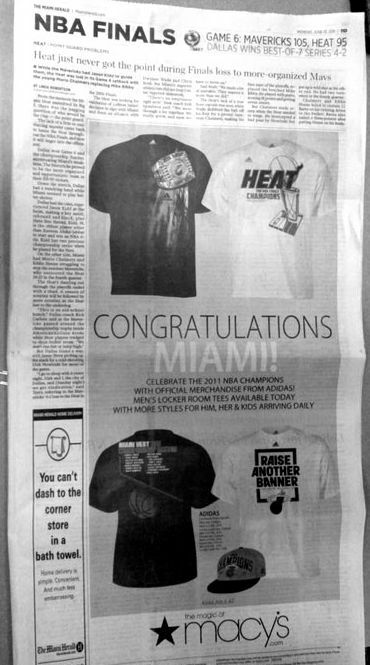 On the day after the Heat were put out of the finals, the Miami Herald ran this in their newspaper. I guess even the newspapers are bandwagoners?